The Seventh symphony is in six movements, the triple-time outer ones in sonata design. The uncompromising drive and cogency of the first, with its angular rhythmic patterns and short-breathed rests, manuals and pedals octaved at the start, fff, at once declares the toughness of Widor’s intentions. Likewise the brevity and assertive ‘no nonsense’ punctuation of the closing cadence. ‘The great majority of organists,’ Saint- Saëns knowingly reminded him years later (29 September 1919), ‘retreat terrified before your works’. The Finale, Near proposes, intensifies the atmosphere of the first. 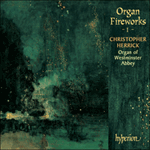 ‘Here is epoch-making organ music, new and thrilling—even hair-raising—in its conception.’ Its magnificent opening subject, Aeolian-cut on pedals against an open-fifth shield and short chordal daggers, lends itself to tight motivic development. The Choral placed second alludes loosely to the slow movement double theme/variation prototype of Haydn 103 and, more particularly (given the added temporal dimension), Beethoven 9. An audibly clear, finely wrought, structure unfolds. First subject, ABA, A major (minor)/C sharp minor/A major, Andante 4/4, forte/piano/forte. Second subject, AB, A minor-E minor, Andantino 6/8, pianissimo. First subject, curtailed reprise, C major (minor), Tempo I 4/4. First variation/development, second subject, C minor-G minor, rising to a sustained soprano cantus firmus on the first subject, F sharp minor, Tempo II 6/8. Second variation/ development, first subject, A major, baroque division style, Tempo I 4/4. Coda, contrasting syncopated (right hand) and augmented (right foot) versions of the first subject, Poco più vivo 4/4. With its distinctively Neapolitan opening, the third movement is a sicilienne à la Mendelssohn in F sharp minor/major, Andante-Allegretto—bringing a touch of grace and light staccato to the proceedings. The central animato is in B minor. An intermezzo-toccata- étude in A minor à la Schumann follows. The most pianistically laid-out of any movement in Widor’s symphonies, its model, Near ventures, may lie in Liszt’s Vision, ‘the funeral of the first Napoleon advancing with solemn and imperial pomp’ (Busoni), the sixth of his Études d’exécution transcendante. ‘The main theme, in long notes [a minore form of the Choral cantus], rides over an accompaniment altogether extraordinary for the organ, a flurry of arpeggiated figuration […] that rises and falls like great waves.’ The second edition (1900-01) revised, readdressed and shortened the original text by 44 bars. Distantly recalling the Orphean pages of Beethoven’s Fourth Concerto, the lento fifth movement, in C sharp minor/major, journeys a high spiritual realm in contrasting paragraphs of proclamation and supplication. Near identifies the first theme of the Choral as the Seventh’s Urmotif. Evidently related in contour and scale reference, though in neither key, harmony, metre nor bass-line, to the andantino of Franck’s Pastorale Op 19 dedicated to Aristide Cavaillé-Coll (1860-62), it variously informs each movement of the work, establishing a quiet, often subliminal, cyclic unity across the whole—at times near-Sibelian in anticipation. The life and career of Charles-Marie Widor, which began in his home town of Lyon, parallels closely that of his near contemporary, Guilmant, in many respects. They were both from a long line of organists and organ builders, both studied under Lemmens, both had successful provincial careers before they received the call to Paris, and both had long-term appointments at major Parisian churches. 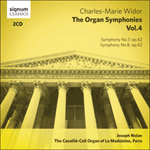 Widor presided at St-Sulpice for sixty-four years; famously the church authorities forgot to confirm his appointment after the initial one-year trial period, making it probably the longest probationary period in history. He made his Paris debut one year after Guilmant, also at St-Sulpice, and also took part in the dedication of the organ at Notre-Dame. Whereas Guilmant’s compositional effort was almost entirely directed towards the organ and the church, Widor cherished much wider aspirations and had successes in the fields of chamber music and the theatre. Aside from a few smaller pieces the bulk of his organ writing is concentrated in the ten symphonies, the equivalent of Guilmant’s eight sonatas. Symphony No 7 was published in 1887, the third of the set of four (Nos 5 to 8) which form his Op 42. The vigorous triple-time Finale is the last of six movements, and is effectively an extended and continuous develop­ment section, based on the striding theme heard in the pedals underneath sustained open fifths. After this striking opening the theme is played legato in the top part accompanied by staccato chords, a favourite textural device. The energy level is kept high, in a continuous whirl of velocity, as the music moves towards flatter keys. A return to the brightness of A minor is accompanied by a vortex of scalic figuration. The final peroration is preceded by a cadenza. La vie et la carrière de Charles-Marie Widor, entamées dans son Lyon natal, présentent bien des parallèles avec celles de son proche contemporain Guilmant. Issus d’une longue lignée d’organistes et d’organiers, tous deux étudièrent avec Lemmens et connurent des carrières provinciales à succès avant d’être appelés à Paris, où ils furent nommés, pour longtemps, dans de grandes églises parisiennes. Widor tint la tribune de St-Sulpice durant soixante-quatre ans—les autorités ecclésiastiques omirent de confirmer sa nomination après l’année d’essai, suscitant certainement la période probatoire la plus longue de l’histoire. Il fit ses débuts parisiens un an après Guilmant, toujours à St-Sulpice, et participa, lui aussi, à la consécration de l’orgue de Notre-Dame. Si Guilmant orienta ses efforts compositionnels presque exclusivement vers l’orgue et l’église, Widor nourrit de bien plus vastes aspirations, s’aventurant avec succès dans la musique de chambre et le théâtre. Hormis quelques pièces de moindre envergure, l’essentiel de son écriture organistique se concentre dans ses dix symphonies, pendant des huit sonates de Guilmant. Publiée en 1887, la Symphonie no7 est la troisième d’un corpus de quatre (nos5–8), formant l’op. 42. Dernier des six mouvements, le vigoureux Finale ternaire est en réalité une section de développement prolongée et continue, fondée sur le thème chevauchant entendu au pédalier par-dessus des quintes à vide tenues. Passé cette frappante ouverture, le thème est joué legato à la partie de dessus, accompagné d’accords staccato—un des procédés de texture favoris du compositeur. L’énergie est maintenue à un niveau élevé, dans un tourbillon de vélocité continu, à mesure que la musique se meut vers des tonalités davantage bémolisées. Un retour à l’éclat de la mineur s’accompagne d’un maelström de figurations en gammes, cependant que la péroraison est précédée d’une cadenza. Das Leben und Wirken von Charles-Marie Widor, das in seiner Heimatstadt Lyon begann, weist viele Parallelen zu dem seines Zeitgenossen Guilmant auf. Beide stammten aus Organisten- und Orgelbauerdynastien, beide studierten bei Lemmens, beide hatten sich erfolgreich in der Provinz etabliert, bevor der Ruf nach Paris kam und beide hatten über längere Zeit hinweg Organistenposten in großen Pariser Kirchen inne. Widor herrschte 64 Jahre lang in St. Sulpice; die Obrigkeit der Kirche hatte es versäumt, das Amt Widors nach seiner Probezeit von einem Jahr noch einmal offiziell zu bestätigen, so dass er die wahrscheinlich längste Probezeit der Geschichte zu bestehen hatte. Er gab sein Pariser Debüt ein Jahr später als Guilmant, ebenfalls in St. Sulpice, und er nahm auch an der Einweihung der Orgel von Notre-Dame teil. Guilmants kompositorisches Werk bezog sich fast ausschließlich auf die Orgel und die Kirche, Widor hatte jedoch weitaus höhere Ansprüche und feierte unter anderem Erfolge in den Bereichen der Kammermusik und des Theaters. Neben einigen kleineren Stücken besteht Widors Orgelwerk hauptsächlich aus den zehn Symphonien, die Guilmants acht Sonaten entsprechen. Die Symphonie Nr. 7 erschien 1887 und ist die dritte eines Viererzyklus’ (Nr. 5–8), der sein op. 42 bildet. Das lebhafte Finale ist der letzte von sechs Sätzen, steht im Dreiertakt und ist quasi ein ausgedehnter und kontinuierlicher Durchführungsteil, der auf einem schreitenden Thema fußt, das in der Pedalstimme unterhalb von ausgehaltenen Quinten erklingt. Nach diesem außergewöhnlichen Anfang wird das Thema legato von der Oberstimme gespielt und von Staccato-Akkorden begleitet: ein beliebtes Stilmittel. Die Dynamik lässt nicht nach und die Musik bewegt sich mit einem schnellen, beständigen Wirbeln auf die Be-Tonarten zu. Eine Rückkehr zum strahlenden a-Moll wird von einem Strudel von Tonleiterpassagen begleitet. Der letzten Zusammenfassung geht eine Kadenz voran.